Different methods of waste disposal have become hot political issues in recent times. Under European Law, its’ members must reduce the amount of “waste” going to disposal, particularly organic waste that can be composted. Composting is seen as the best option in a waste disposal hierarchy which has landfill as the worst. Starting from our homes, we can all do our bit to promote and facilitate composting and to ultimately reduce the amount of this organic material going unnecessarily into our landfills. When this organic material is in our landfills it goes anaerobic. This means that it decomposes without the presence of oxygen. The result of this is that the highly potent gas methane is released. This very harmful greenhouse gas is made up of carbon and hydrogen (CH4) and the carbon content of its’ composition is one of the main contributors to global warming. Download and read the Clean Ireland Recycling home composter manual. All natural products that were once part of a living organism will slowly rot if the conditions are right. Composting is a way of accelerating this process by creating the ideal conditions for a variety of small organisms, most of which are only visible through a microscope. When the micro-organisms have done their work and the material is fully broken down biologically, the result is a very rich useful fertiliser for soil conditioning. Successful composting depends on bringing together the correct materials for composting and in the right proportions. There are two types of materials necessary for successful composting. NOTE: Food waste should not be home composted as it creates problems with odours, rodents, etc. Raw fruit and veg peelings is the exception. Food waste can be composted using a home wormery. This is probably for the more experienced home composter and it is advised that basic home composting techniques using greens or garden waste be tried first. When in the correct proportions it will all compost. If it’s too wet, it will stagnate and go smelly. If it’s too dry, it will just remain and nothing will happen. The ideal conditions are that the material needs to be moist but with sufficient air spaces through it for aeration. If the above conditions are correct, the millions of micro-organisms required for good composting will do their job. A lot of people try and fail on even the first few attempts to successfully home compost. It comes with a bit of experience and can be very satisfying when you eventually end up with a lovely brown/black rich compost for your flower beds and elsewhere in the garden. Home composting can be done in two ways. Firstly, you can create a compost heap at the end of your garden. Put the correct proportions of GREENS and BROWNS together with plenty of air spaces through the heap. Ideally the heap should be covered to keep off unnecessary rain water. The heap will heat up. This is the micro-organisms at work. If the heap cools down then it may need to be turned. This turning will aerate the heap again and the micro-organisms will get back to work and you will be most of the way there to having a useful fertiliser for your flower beds. Remember one thing! Even if you ignore all of the above information and just put all your garden waste in a heap and forget about it, IT WILL COMPOST. It will eventually be broken down and become a useful substance that will enhance your soil, it will just take a little longer. The second way to home compost is to use a home composter. These home composters are normally made from plastic and are relatively inexpensive. Do be careful which home composter you purchase because there are many cheaper ones on the market that do not support easy home composting. Clean Ireland Recycling has actively researched the market with regards to home composters. We believe we have found the most suitably designed home composter that has all the functionality required for the most successful home composting. Designed to facilitate MAXIMUM aeration. Mesh base comes up the sides a little. This allows air up the bottom but also in the sides. 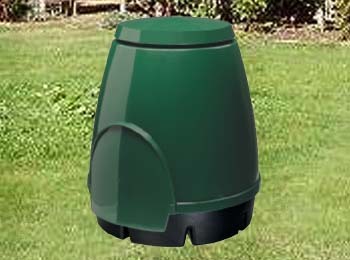 Very importantly there is an AERATING CONE in the centre of the composter. This allows air to get into the middle of the compost. Removable side door to allow for very easy access to remove the composted material. Many composters have a very small opening and are difficult to empty. Composter is designed so that you can remove the fully composted material from the bottom, and the material that is not fully composted yet will just move down towards the bottom. This means you can always be removing useful compost without having to wait until the batch is fully finished. The criteria for these composters is very similar to composting in a heap. E.g. correct mix of GREENS and BROWNS. Obviously, you do not need to worry about covering them as they are covered with a plastic lid. Successful composting of your garden waste and the creation of your very own non-peat-based compost for the enhancement of your own garden is very fulfilling and is in many ways a better compost than you would buy in the shops. Approximately 40% by weight of the material in your waste bin is organic waste and can be collected in a Brown Bin Food Waste Scheme. This post-plate food waste will go on for composting or for anaerobic digestion which can create electricity as a by-product. You should home compost your garden waste, so that you can create a useful compost for your garden and also so that you can save money with disposal. Your garden waste should never go in your waste bin or your brown bin for food waste. It is far too expensive to have to get your garden waste treated externally when you can do it yourself very easily. Basically, anything that was once living, either plant or animal can be composted. Food waste is not suitable for home composting with the exception of raw peelings. Food waste can attract rodents, cause odours and create other problems. WILL COMPOSTING ATTRACT RODENTS, PESTS AND DISEASES? Home composting green or garden waste will not attract any unwanted pests, rodents, odours, etc. These problems arise when people attempt to home compost food waste. Raw fruit and vegetable peelings are the exception. Food waste either cooked or raw is best disposed of in a brown bin scheme if available. I HAVE ONLY A SMALL SPACE IN MY GARDEN, WHAT IS MY BEST OPTION? If you have only a small space then you should only have a small amount of garden waste. Your best solution is probably an aerated home composter as mentioned above. These provide very good aeration which is the single most important criteria for successful composting. WILL I CREATE A SMELL BY HOME COMPOSTING? Composting should not create any unpleasant smells. If you do notice an unpleasant smell, then your heap is lacking air. Add more rigid brown material in order to create air passages through the material and this should alleviate the problem and get everything going again. WHERE CAN I BUY HOME COMPOSTERS? You can purchase home composters from any of the Clean Ireland Recycling offices. Contact Clean Ireland for details. From extensive research, Clean Ireland Recycling home composters are the best on the market as regards value and functionality. We hope Home Composting is a success for you!